Discussing Writing Mysteries with S.K. Rizzolo and Who She’d Love to Solve One With | Oh, for the HOOK of a BOOK! 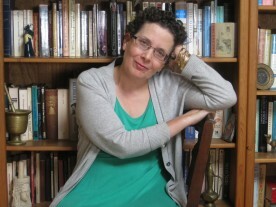 Today, I have a lovely and interesting interview with Regency mystery writer, S.K. Rizzolo! If you missed my review of Die I Will Not, the third book in her mystery series, you can read it here. Hi S.K.! Welcome to Oh, for the Hook of a Book! I usually invite my guest over for a chat and tea, but it’s freezing here in Ohio with snow, so usually when that happens I instead invite myself over to the interviewee’s home. I’ll be crashing, but if you lead me to your kitchen, I’ll make the drinks. What is your drinking pleasure for afternoon chats? If I was home, I’d be putting on the tea kettle for some Earl Grey, but if it’s warm weather, iced tea sounds good too. You? S.K. : Hi Erin. Thank you for visiting my home in L.A., where it is currently 80 degrees and windy. No matter the weather, I too am a big tea drinker. I like Earl Grey and also enjoy a spicy Chai. Erin: Wonderful, I also enjoy spicy Chai! Let’s splurge and have two pots. I’ve managed to pack some of my scones. I generally prefer blueberry but we had picked apples and have so many left, I’ve opted for apple cinnamon, just point me to the plates….there now, we are all ready for a proper chat. S.K. : I’m not much of a cook—but at this time of year, I’ll add to our feast by making you some pumpkin spice scones from Sticky Fingers mix. Yes, let’s get started. Erin: Well, you don’t have to do that, but those sound delightful too. You’ve just published Die I Will Not, your third book in your mystery series. Does it get easier each time you do it, or do the same emotions appear with each launch? S.K. : I took a long break between book #2 and this new novel. At the time I was teaching and raising my daughter, and I just wasn’t in a place to continue the series. In that decade the publishing landscape has changed almost beyond recognition. I’ve had to start over with my career and relearn the business, accustoming myself to social media and online promotion. Since I’m a rather quiet, private person, this has not always been easy for me, though I’m finding my way now. Erin: Oh, wow! To me, it’s amazing how much has changed in 10 years! I’m glad you picked back up your series. I’m anxious to ask you some more questions about your writing, life, and books, so let’s get started! Q: Die I Will Not, as I mentioned, is the third book in the series. Since I haven’t had you on my site before, and readers might not be familiar, would you mind talking about your first two books, the premise for your mystery series, and how it all leads into Die I Will Not? A: Set in Regency England, my mystery series follows the exploits of a Bow Street Runner (a sort of forerunner to the Scotland Yard detective), an unconventional lady, and a melancholic lawyer. My characters do not belong to the Polite World, and they face financial struggles as well as professional and romantic challenges. The first novel in the series, The Rose in the Wheel, introduces Penelope Wolfe, a young, unhappily married mother, whose husband Jeremy is always leaving her in the lurch. When Jeremy becomes a suspect in the murder of a lady philanthropist, Penelope works with Runner John Chase and Edward Buckler to solve the crime. Blood for Blood reunites my protagonists, as they uncover the killer of a footman. This book deals with millenarian religion and festering family secrets. Die I Will Not finds Penelope striving to clear her father’s name. A Tory newspaper editor has been stabbed while writing a reply to the latest round of political letters penned by the firebrand Collatinus. Twenty years before, Penelope’s father also used the alias Collatinus before he fled London just ahead of accusations of treason and murder. This time Chase and Buckler put their careers at risk to stand behind her as she faces notoriety in the press and continuing marital turmoil. Recently, I’m having fun with the developing romance between Buckler and Penelope, with John Chase serving as an amused, envious, and somewhat disapproving bystander. Q: I love mysteries, from all time periods, but I haven’t read as many from the Regency period. Can you define what it means to call them Regency mysteries and how they might differ or be similar to other mysteries people might like? A: Some readers come to Regency novels with a bit of background knowledge about the genre and the period so that I don’t need to explain who the Prince Regent is, for example, or why my heroine is worried about preserving her reputation. But because of Georgette Heyer, who might be said to have invented the modern Regency novel, readers sometimes have fairly defined expectations. They may expect an ordered world of darkly handsome and devil-may-care dukes, ballroom scenes, society scandals—a sort of comedy of manners, which, by the way, I do love as a reader. But I long ago decided that I didn’t want to write along those lines. So my books deliberately avoid that world. My heroine is part of the gentry—but her imprudent marriage has forced her to the fringes of Society. Her father is a radical, expatriate philosopher. Her husband is a spendthrift artist. Her true love Buckler has the spirit of chivalry in his heart but isn’t particularly dashing or self-assured himself. I like exploring some of the off-the-beaten-track aspects of life in Regency England, such as radical politics, the growth of celebrity culture, and nascent feminism. Q: Many times mysteries are defined by one phrase under the title, “A (Name) Mystery,” with the name being the detective or key problem solver. Not often do two people grace the limelight. On your books, you state “The Penelope Wolfe/John Chase Regency Mysteries.” What was your thinking behind giving them both center stage? Do you use them both as main protagonist or is one the side-kick, like in Sherlock and Holmes? A: I think I originally assumed that I needed to make the professional detective the main character, but from the start Penelope and Chase have shared the stage (with Buckler as an almost equal participant). It’s surprisingly difficult to weave the experiences of three separate human beings around a complex mystery plot. The trouble is that I love all three of them as if they were my dear friends and don’t want to ignore one for very long. I try to focus on the interplay between them and nurture the character growth in that way. Q: I, too, am fascinated with all things British. I was even born there when my parents were living overseas. A) What drew you to the tales of the wives of Henry VIII in your younger years? B) What is a close second in terms of historical interest? A: It’s difficult to say. As a child, I read voraciously, and my sister, who was a children’s librarian, used to provide much of my reading material. She was the one who cultivated my interest in British literature, history, and culture by introducing me to the work of E. Nesbit, Penelope Lively, Susan Cooper, Joan Aiken, and Leon Garfield. Of course, my interest includes the films of Masterpiece Theatre—I think I’ve seen most of the period British miniseries! I don’t know that I have a close second, though I do appreciate historical fiction set in America and other places too. Q: We have a lot in common as I was also an English major in college. However, I chose to major in Journalism and History also thinking to create some sort of way to NOT have to get up early and stand in front of others teaching all day. What was I thinking? So, my question is, what did/do you like most about teaching English? Are you glad you chose that route or is hindsight 20/20? A: I definitely understand what you mean about the getting up early part. But I find it strange that I stumbled into precisely the right profession for me. For me, teaching is about helping students learn to think critically and express themselves clearly. And I want them to appreciate that literature does indeed have relevance in the 21st-century—that our reading is not boring, musty old stuff written by long-dead graybeards who maybe only wrote the stuff to torture endless generations of students. I’d like the students to see that reading books of all kinds helps us answer, or at least ask, the bigger questions in life. Q: What encouraged you to take the plunge to start writing fiction novels? Did your career in English help you to write better books or is it strictly talent and the avid reading you do that helped you? A: I always meant to write one day but had thought I would end up writing for children. I’ve been teaching writing for 25 years. That must have helped. But mostly I’ve learned through being a lifelong reader because novelists are readers, first and foremost. Q: Speaking of being an avid reader, what types of mysteries or authors have you liked best? Who is a mentor in the craft of writing for your and also, who do you read for enjoyment? A: I like traditional English mysteries that delve into character motivation and psychology. I dislike excessively grim stories that dramatize graphic violence toward women or that spend much of the narrative inside the minds of twisted serial killers. I’m too squeamish and tenderhearted. As far as mentors, I would choose P.D. James, Elizabeth George, or Deborah Crombie—all fabulous mystery writers. As far as historical mysteries, I greatly enjoy the work of Stephanie Barron, author of an outstanding mystery series with Jane Austen as the sleuth. Q: Back to your own novels, how did you decide the time period to set them in and why did you choose to utilize commoners as the lead(s)? And beyond that, why did you choose particular careers for them? A: I grew up reading Austen, the Brontes, Trollope, Gaskell, and many other authors from the Regency and Victorian eras. My family often tells me that I was born in the wrong century, and it’s true that I regularly retreat to the past to hang out, as my character Buckler once said, among congenial ghosts. To answer your second question: it made sense for me to have one protagonist in the police and a second in the law. My female protagonist has no choice but to be an amateur sleuth. Still, she has ambitions to be a professional writer. Q: How did you construct your believable and unique characters? A: I stared at the wall for a very long time and wrote page after page of notes until the characters started to come to life. I continue to stumble upon research tidbits that flesh them out, and that’s always exciting. A: An outline can be a slippery thing. If only events would unfold as expected in the story, but that almost never happens. Creating a mystery is like grappling with one giant logic problem: as soon as one variable fits smoothly into its proper position, another one wiggles free. I find that my plots can suddenly get in a knot when a question about modus operandi pops up, and I realize I have no idea how to answer it. I’ve made my peace with the constant rethinking and frantic plugging up of unforeseen plot holes. Q: How much factual history do you use in your novels? If you do, what? Have you had to do much research? A: I could, and often do, spend days and months researching just one of the topics in a novel. Creating atmosphere depends upon getting the details right and layering them into a scene with a light hand. And that in turn requires lots and lots of research before one word ever gets written. It’s a little like being a magpie. I find one bit of treasure here, one nugget there—and hoard it until it fits perfectly in a particular scene. Research is especially crucial in a historical mystery. A historical novelist asks readers to believe that her characters inhabit a world that is long gone and may seem foreign. Q: If you could solve a mystery with one person from history by your side, who would that be and why? A: Jane Austen. Her ironic wit and sharp intelligence would be immensely useful in any investigation. I’d also welcome help from the Victorian novelist Wilkie Collins. A man able to craft a tight, suspenseful plot the way he can would be more than a match for any criminal. A: Who knows? I anticipate that Penelope Wolfe will one day travel to Sicily, her childhood home, and Sicily is not too far from where I lived in Tripoli, Libya. I am fascinated by the Barbary pirates who infested the seas around North Africa in the early 19th-century (I think you’ve just given me an idea!). Q: What is next for you with your writing? Will you continue to write mysteries? Also, do you hope to write other books besides mysteries? A: I plan to write book #4 in my series. Having left Penelope Wolfe in a precarious position at the end of Die I Will Not, I must figure out how she will cope with her family problems while she helps solve a new mystery. I have some ideas for this story, which will revolve around a disputed inheritance. Yes, I would love to attempt a historical epic one day: one of those fat, engrossing novels in the vein of Anya Seton’s Katherine or Ken Follett’s The Pillars of the Earth. Q: You seem to be living a full and exciting life as an author, lived cool places and now in L.A., with a husband who works on the biggest comedy on TV, so what adventures or marks of success are on your bucket list? A: I wouldn’t call my life exciting! Mostly, I travel in my imagination these days, spending my time reading, writing, or grading papers. But I am ambitious to keep growing and improving as a writer. I’d also like to take a walking tour in England with a girlfriend. That seems like a better way to see a country. Q: And a fun question, if you were solving a mystery, what would be the best dinner you’d have on a train (because I always imagine people solving mysteries while on a train) and where would you be traveling? A: Caviar, champagne, and a soufflé on the Orient Express. Since I never eat such things, they sound suitably exotic. I would be traveling between Paris and Istanbul, a city I visited as a child and have always wished to see again. Q: Where can readers connect with you, when you aren’t solving mysteries? A: I encourage readers to email me at skrizzolo.gmail.com. I do check my Facebook page, but I hang out more frequently on Goodreads. Erin: Thank you so much for taking time out to do a fun interview with me! It’s been a great time, and I thank you for letting me crash your home and kitchen! It’s was warm and lovely. I look forward to reading more of your books in the future. Best wishes with your writing! S.K. : Thank you, Erin, for spending time with me. I so much appreciate your kindness and friendliness. Erin: Welcome back, anytime. You can crash my home next time. S.K. Rizzolo is a longtime Anglophile and history enthusiast. Set in Regency England, The Rose in the Wheel and Blood for Blood are the first two novels in her series about a Bow Street Runner, an unconventional lady, and a melancholic barrister. 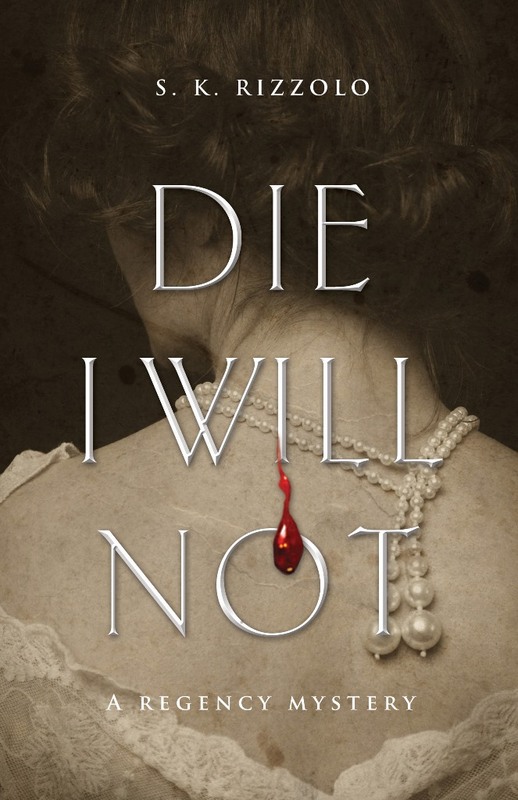 Die I Will Not is third in the series. An English teacher, Rizzolo has earned an M.A. in literature and lives in Los Angeles with her husband and daughter.